Our beautiful wife, mother and grandmother, Erline Goodell left this world on March 30th after a three-year journey through the complications of multiple strokes. Throughout these years her amazing husband, three children, son and daughter in law, and eight grandchildren were by her side holding her hand and keeping the faith that she would recover. Erline began her life in Portland, Oregon on October 10th, 1939 as the daughter of Ted and Elizabeth Elkin. Her family moved around quite a bit when she was a child and her older sister Joyce and younger brother Tom were a wonderful comfort to her. She attended UC Santa Barbara where she met and fell in love with Dexter Goodell, her beloved husband of 56 years. She began her life long passion for learning with her teaching credential and a job as a third grade teacher. Throughout her life she touched so many lives through education. She was the director of Head Start, Sunday school teacher, Hospice volunteer and a tutor. During these years she raised her three children Wendy, Delene and Peter. She was a constant in their lives. Creating a childhood filled with art, music, camp outs, backyard plays, summer days at the beach, and love. When her children began to establish their own lives, she went back to UCSB as a full time student in the Religious Studies Department where she earned her second BA and was awarded her Masters. 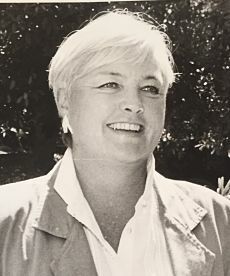 Erline then kicked off a progressive career with classes on Feminist Theology, Midlife Crisis and Menopause, discussion forums called Midlife Zest, Comparative Mysticisms, the gospel of Judas and Santa Barbara City College Adult Ed class on the Da Vinci Code. Then she started writing poetry and published three collections and one book on her travels to mystical places in Europe. Erline was a lifelong learner and creative thinker. Erline had so many gifts. She loved each of her family members without hesitation, judgment or question. She took the time to fully understand each of her grandchildren’s individuality. Dexter offered her a life of adventure and love. They traveled the world seeking out ancient and mystical sites with Erline setting the course and Dexter navigating. Erline’s memory lives on through her husband Dexter; their children Wendy (Bruce); Delene; Peter (Laura) and her 8 grandchildren: Tanner, Austin, Erin, Parker, Elise, Allison, Travis and Ames. Donations in Erline’s memory can be made to Santa Barbara Scholarship Foundation or Visiting Nurses Hospice-Serenity House. A celebration of Erline’s life will take place at the Santa Barbara Yacht Club on Thursday, June 2nd at 3:00.